Finding Your Way with Your Baby explores the emotional experience of the baby in the first year, and that of the mother, father and other significant adults. It does so in a way that is deeply informed by psychoanalytic understandings, infant observation, developmental science and decades of clinical experience. Combining the wisdom of many years' work with the freshness of up-to-date knowledge, Dilys Daws and　Alexandra de Rementeria engage with the most difficult emotional experiences that are often glossed over in parenting books – such as pregnancy, through birth into bonding, ambivalence about the baby, depression, and the emotional turmoil so often brought to the surface by being a new parent. Acknowledgement and understanding about this darker side of family life offers a sense of relief that can allow parents to harness the power of knowing, owning and sharing feelings to transform situations and break negative cycles and old ways of relating. With real-life examples, references to current thinking and a calm and simple writing style they also provide new insights into the more commonly covered issues such as weaning, sleeping and crying. 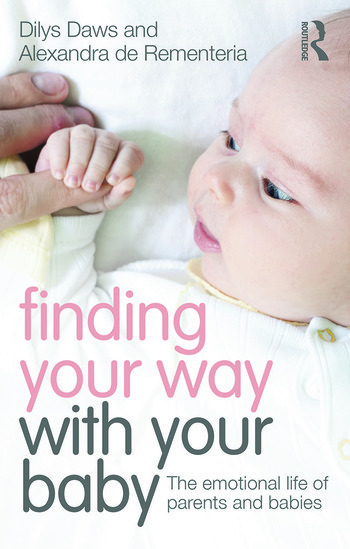 Finding Your Way with Your Baby is primarily aimed at parents but it will be a helpful resource for all those working with parents and babies including health visitors, midwives, social workers, GPs, paediatricians and childcare workers. It will appeal to parents and professionals who are interested in ideas from psychoanalytic clinical practice and the latest research in developmental psychology and neuroscience. Introduction. Part 1: Becoming a Parent. Life Will Never be the Same Again. Bringing Your Baby Home. Bonding. Being a Good Parent. Figuring Out Fatherhood. Baby Blues and Post-Natal Depression. Part II: Being with Baby. Conversations With Your Baby. Feeding. Sleeping. Crying. Weaning and Teething. Learning Through Play. Your Baby’s Emerging Sense of Self. Part III: The Wider World. Wider Family and Other Support. To Work or Not to Work. Recommended Reading. Bibliography. Dilys Daws is Honorary Consultant Child Psychotherapist at the Tavistock and Portman NHS Foundation Trust, London, and continues to practise at a baby clinic at the James Wigg Practice, Kentish Town. She was Founding Chair of the Association for Infant Mental Health, UK and was Chair of the Association of Child Psychotherapists. She has fifty years of clinical and teaching experience, much of that on work with parents and babies and has lectured on infant mental health widely in the UK and abroad. Alexandra de Rementeria is on the doctoral training programme for child psychotherapy at the Tavistock and Portman NHS Foundation Trust and works at Lewisham Child and Adolescent Mental Health Services. She taught Early Years for five years prior to having her family and moving into mental health. She is the author of numerous articles for publications including the Journal of Psychodynamic Practice and the Journal of Infant Observation.